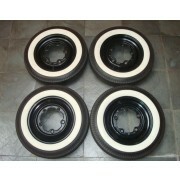 Set of steel wheels 15" original VW, closed model for Volkswagen bugs (Oval 1953 up to 1957), (Squareback 1958 up to 1964) and Karmann-Ghias. 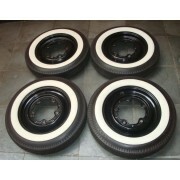 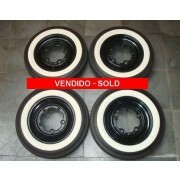 Product: Used (4 wheels VW - 5x205, 4 new inner tubes, 4 wide white wall tire insert 15'', 4 tires of the mark Goodyear 5-60-15", being 2 new tires and 2 tires mid life. 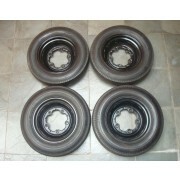 Jogo de rodas 15" de ferro originais VW, modelo fechada para fuscas modelos (Oval 1953 até 1957), (Squareback 1958 até 1964) e Karmann-Ghias. 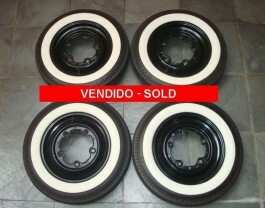 Produto: Usado (4 rodas VW - 5x205, 4 câmaras de ar novas, 4 faixas brancas 15", 4 pneus da marca Goodyear 5-60-15", sendo 2 pneus novos e 2 pneus meia vida.